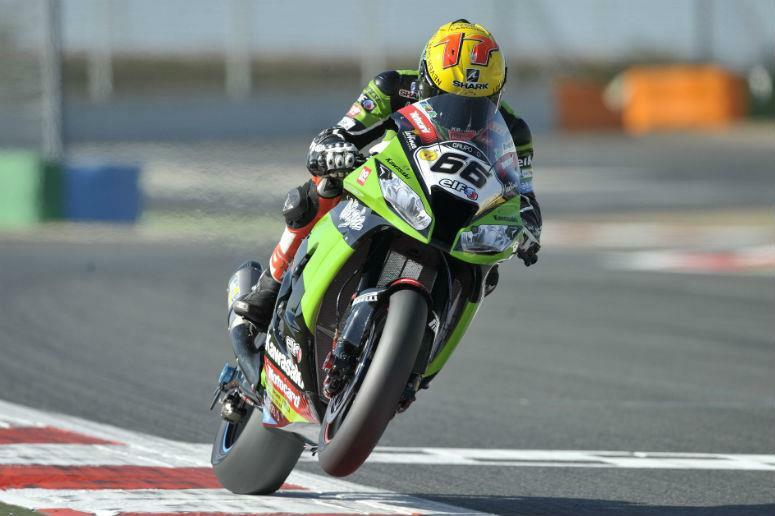 Kawasaki’s Tom Sykes closed within 14.5 points of championship leader Max Biaggi after taking third position in damp, tricky conditions at Magny Cours. Factory Aprilia rider Biaggi crashed at the end of the long back straight, uninjured on lap two. BMW’s Marco Melandri finished second in the dramatic wet race and is still very much in the title fight, only 18.5 points behind arch rival Biaggi and only four points behind the British Kawasaki rider, Sykes. Sylvan Guintoli took the victory in front of his home crowd, his second win of the year on the PATA Racing Ducati and his third in total. BMW’s Leon Haslam battled to fifth position, while Eugene Laverty struggled with a lack of rear grip in seventh. Eugene said “I was just trying to stop it spinning, having to stand it up and take strange lines looking for grip”. Leon Camier had a monumental high-side in turn one, crashing out of sixth position, luckily he managed to walk away with help from the marshals. Chaz Davis unfortunate weekend continued when he crashed his ParkinGO Aprilia on lap two.